It began as The Mitten Tree. Every December for many years Christian Education Board and later the Outreach Board set up an artificial Christmas tree in the Bess Fulton Room and decorated it with hats, mittens, gloves, scarves. These were distributed to local schools and charities to warm hands and hearts. In recent years the Mitten Tree donation opportunity has stretched to include the full year as we recognize the need in Michigan for warm apparel well after Christmas. To facilitate collection of these types of items, a series of wooden boxes in the design of an evergreen tree allows easier placement of donations. This is located in the same place as the Christmas Mitten Tree in the Bess Fulton room. We are always requesting donations of diapers and feminine hygiene products as well as paper towel, toilet paper, napkins, plates, etc. Note that DIAPERS are in especially great demand, the larger sizes, 4, 5, or 6 and will be accepted EVERY month. And anything you wish to donate is appreciated! 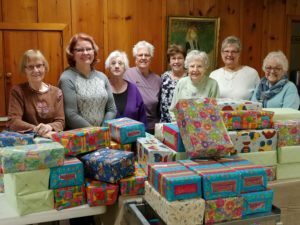 March 2019 we assembled 70 shoeboxes of games, toys, small individual wrapped snacks for our “Shoebox Ministry”. Shoe boxes are spring break entertainment and distributed thru Eaton Clothing and Furniture Center as well as Siren Eaton Shelter for children not lucky enough for a family vacation over spring break. April/May 2019 will be simple household tools: hammer screwdrivers, pliers, and especially needed are good quality can openers. The Giving Tree donations for February and March was a highly successful bedtime theme of kids pajamas/books and incorporated with hand made pillowcases. Packaging of these gifts was combined with a celebration of Dr. Seuss’ birthday party during Sunday School March 3rd. January 2019 we requested sheet sets and small size men’s jeans for the ECFC, waist sizes 28 to 34. August and September 2018 were socks and underwear, especially for students returning to school. October was towels and linens. November is always offerings of the Brown Bag — food and grocery items and White Bag — toiletries and health items. December we will once again collect mittens, scarves, hats and winter paraphernalia for our community. Don’t forget winter Coat Drive. Your monetary donations toward this will allow us to purchase coats at quantity discount for people less fortunate. These are distributed thru SIREN/Eaton Shelter and Eaton Clothing and Furniture Center.